Ahead of their Passing Clouds gig last weekend, we caught up with Ibibio Sound Machine front woman, Eno Williams, to have a chat about the bands origins and the sounds and artists who drive them the most. London born Eno originally hailing from Nigeria, formed Ibibio with fellow bandmates/producers Max Grunhard, Leon Brichard and Benji Bouton. 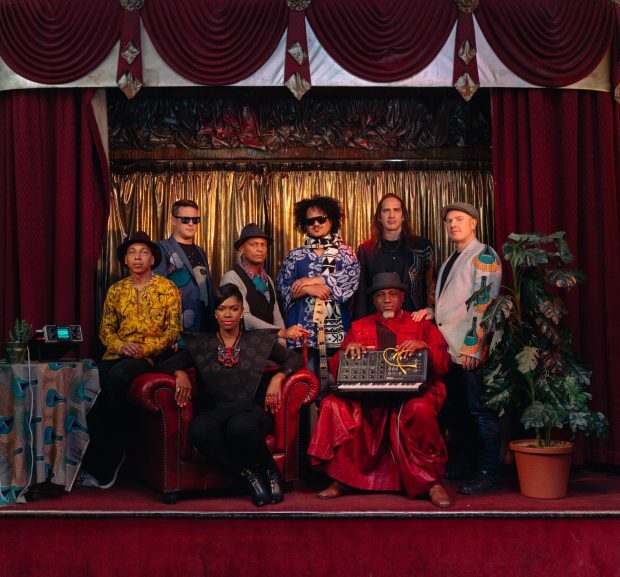 The collective fuse afrobeat with an array of westernised electronic sounds and lyrics sung solely in Ibibio, resulting in a hybrid of London-meets-Nigeria and beyond. With the band creating this relatively brand new sound, I asked Eno if there were any apprehensions as to how London would react to this new sound. Yes- I was a bit hesitant doing it at the start. to be honest it was about taking that bold leap of faith, it was all about jumping! I remember hearing a quote saying until you make that leap of faith you’ll never know what’s on the other side, I thought we either do it or we don’t. My grandmother used to tease me many years before, asking if I would ever sing in Ibibio and my sisters and I would joke around about it. Then it came to the point when we had to think of something new, create something fresh and I remember singing one of the songs to Max (Grunhard) and he noticed that the language was very rhythmic and musical. One track led to another and another until we found we had a whole record that we didn’t know what to do with! I was very hesitant as I knew people wouldn’t understand the language but I always remember what my mother told me, ‘If you do believe in what you’re doing, you’ll do it regardless’. Its been amazing to see how people have received us, trying to sing along and always vibing with us and the music. In terms of the language barrier, have you ever felt it as a ‘barrier’ or does it do the reverse and help to break down walls? In some cases, we’ve had to do a little transcript of each track online, a synopsis/translation of each song and the storytelling behind it, and then often during shows I give a short explanation before a song to give the crowd a picture of what I’m singing about. I always say music is so universal, personally I listen from anything from Spanish to French, through to South African music and often you don’t understand what the singer/artist is singing about but the chills are still there, you still have a spiritual connection to the music. People often get it because of the spirit behind it. The band is so eclectic in terms of the multiple nationalities, with a Brazilian percussionist and a Ghanian guitarist, how do you feel that their backgrounds are bought to the forefront of Ibibios sound? You can definitely see and hear highlife influences through Alfred as he’s quite big on the highlife sound, which comes across on a lot of the songs. There’s also Anselmo whose Brazilian and brings that earthy, percussive drum sound which is quite African, so you definitely hear the marriage between the afro and Brazilian sound. Then of course there’s the Sci-fi sound of the synth, brought by Tony and Max, with their Jazz background being heard in the horn arrangements. I think everyone brings their own thing to the sound you hear. I always call us the United Nations Of Music! I remember my grandma saying it takes many ingredients to make a beautiful pot of soup, and I feel like that’s what we do with our music with all our different backgrounds and influences. I feel that this would only be possible in London, as its such a melting point of cultures and I’m so grateful we get to do this in such a cosmopolitan place. London is indeed a melting point, it absorbs so many styles, cultures and music but how did you all end up finding each other, having come from all over the globe? I really do believe music brings people together. Some of us had worked together previously, such as Alfred who had been in the band KonKoma in the past and one thing led to another, everyone figuring out who can do this/that and we were all up for trying out different things. Everyone was ready to out their hands to the plough and try this new sound. There was a new gap to be filled, a new sound waiting to be birthed. Everyone was ready and up for it. 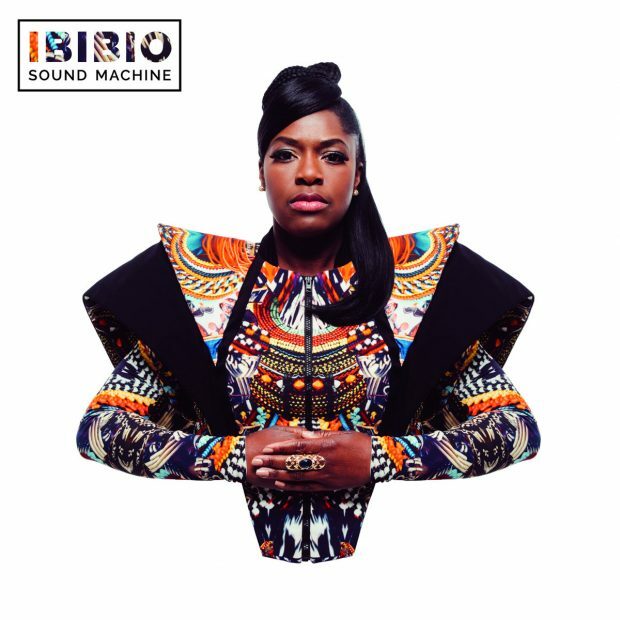 Amazing, so before Ibibio were you all involved in other projects? For some of you was it your first major venture into music? We were all doing things individually and collectively but through working together we knew it was right, these were the right kinds of people. They all had this shared passion for the style of music so it felt obvious to get everyone involved. Your self titled debut drifts so easily from Electro, through to Highlife then into more unexpected grounds such as Gospel. How important was it for you to cover all bases in terms of African genres or was it more subconscious and not what you all set out to do initially? I think when creating you can’t map things out too much else it becomes too clinical and almost contrived so its a case of letting the creativity just flow. Yes, Gospel because I sang in a choir many years ago and growing up my parents were very spiritual so we were brought up around the Church with American/African gospel. Coming to the UK to study I was introduced to so much new music, growing up I was listening to Manu Dibango, The Beatles, Aretha Franklin, Whitney Houston, the list is endless. I think my brain was full of all these sounds, Funk, Jazz, Highlife etc and so being in the middle of all these different backgrounds it was naturally the sound that evolved as a result. Back home in Nigeria, do you know what the general reaction is to Ibibio? Ibibio are not yet hugely known out there, just yet but there are a few people who come to the shows and are quite blown away by the music’s African background and we are hoping to go out there very soon. Might have to nudge some people and hand out a few flyers to get our names spreading! You guys are no strangers to UK festivals, having performed at a string every summer over the last couple of years. Having personally seen you play last year, I’d like to know what’s your favourite festival to play and why? That’s like choosing a favourite child out of many children! I loved them all, Glastonbury, Boomtown, Latitude, Womad, they’ve all been amazing. UK and European festivals are such a great platform to discover music live that you wouldn’t get to see otherwise. Festivals have been great for us as we’ve been able to showcase our work and gained a lot of friends along the way. Well hopefully we’ll be seeing you at a lot more this year. Going forward, the band has some new material in the works. Without giving too much away, what direction can the fans expect Ibibio to go in this time around? There is some new material! We’ll probably keep to the same formula as the first album but grow from what we’ve done and still keep true to the sound, whilst still helping people to understand what I’m singing about in Ibibio, maybe with some English one liners here and there to open it up a little bit but yes, we’ll still keep to the form.